If you are a seasoned waterfowler, you certainly already have a shotgun style preference. But how long has it been since you thought about the advantages and disadvantages of your waterfowling gun? I cannot list every advantage and disadvantage of the four shotgun types, but here's a summary of the primary factors that make semi-autos, pumps, over/unders and side-by-sides the shotgun types of choice for North American waterfowl hunters. Semi-autos are the most popular shotgun type for duck and goose buffs. And rightly so. Like pump guns, autoloaders give us a third shot, which can be a big advantage in bringing down an escaping cripple still in the air or to dispatch a cripple on the water. One disadvantage of semi-autos has been reliability and foolproof function. However, it has become less of a problem over the past decade or two. The Benelli Super Black Eagle and the Beretta Xtrema have raised the reliability bar. These shotguns, and others, have taken away a major advantage pump guns once had -- pumps work -- over and over, time after time. Such reliability was not always the hallmark of a semi-auto, especially when steel shot was introduced and while shotshell companies worked to develop suitable powders for steel shot loads. Today, steel loads and other non-toxics are simply great in comparison to early loads. But steel shotshells were once a real problem for autoloaders. Another advantage of semi-autos is reduced felt recoil, particularly in gas-operated guns. 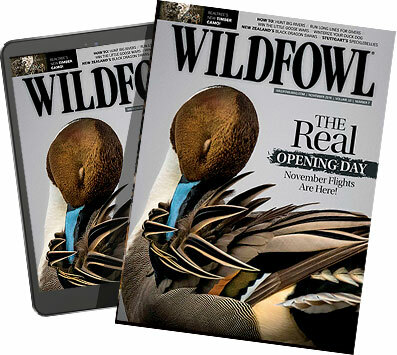 Wildfowl hunters desire less recoil because of the heavy loads we shoot, and because they are driven at very high velocities. Gas operation bleeds off gas in vent holes in the barrel to eject the just-fired shell, release a live shell from the magazine tube and then feed it into the chamber. Semi-auto actions that do not use gas operation (for example the Browning Auto-5 and all of the Benelli models) reduce recoil very minimally in comparison. However, Benelli has largely addressed the problem with the development of the ComforTech stock for its Super Black Eagle. Its recoil-reducing stock is also fitted to several other Benelli models. Further, the new Vinci semi-auto adds even more recoil reduction qualities with the gun's ComforTech Plus stock. Browning's new Maxum model semi-auto, even though it works with recoil-reducing gas operation, has a newly designed stock to help reduce recoil. Yet another advantage of the semi-auto, especially those featuring the most modern designs, is reduced weight. Lighter weight accentuates recoil, but it tends to improve handling qualities in a fast-shooting situation -- sporting clays champions who fire 30,000 shells a year out of heavier over/unders not withstanding. Of course, plenty of sporting champs shoot semi-autos. Ejection can be a disadvantage. Semi-autos can throw the empties into the face of your shooting partner, which is not the greatest of etiquette when birds are swirling above. So if two shooters are in the blind, one with a semi (or a pump gun) it's probably a good idea to put that person on the right side of the blind, assuming the person shoots a semi that spits hulls out the right side of the receiver. For decades, the forte of pump guns has been reliability. Most pump guns will keep denting primers and ejecting fired shells, despite rain, crud in the action and worse. But operator error can be a problem. Shooting a pump gun effectively and rapidly is more difficult to learn than shooting a semi-auto. I'm not claiming it takes forever to learn how to operate a pump gun, but it takes practice, as evidenced when sporting clays first came to our shores. Actually, the game was originally dubbed Hunter's Clays, because when hunters came out, they often brought their hunting pump guns. It was amazing to see so many shooters not being able to shuck a fired round and feed the next one without a mishap -- or to do it quickly enough. However, when the art of handling a pump is mastered, the sound of the action operating is covered by the reverberating sound of the shell because the pumping is so quick and fluid. As with a semi-auto, the pump offers a third shot -- so often a real bonus in waterfowl situations. Prices are rising for almost all sporting goods, but especially for firearms. Semi-autos have seen the biggest increases in suggested retail. Pump guns have not been affected as much by price, so they are consequently the least expensive, but still reliable shotguns available. Being fixed-breech guns, pumps have no built-in recoil reduction. They also tend to be relatively lightweight. So they kick big, which is a significant disadvantage, especially for hunters of smaller stature, youngsters and women. Benelli has helped the recoil problem by putting its ComforTech stock on some Nova model pump guns. Like semi-autos, most pump guns spit empties out the side of the receiver, potentially at a shooting partner to your right. When your empty has dinged his expensive over/under and caused him to miss an easy greenhead, you might not be invited to hunt with him again. A pump gun with bottom ejection such as an old Ithaca Model 37 or more modern Browning BPS can eliminate the problem. For semi-autos fans, the Remington CTi 105 has bottom ejection. The big disadvantage for an over/under is it must be opened quite a distance to eject the empties and insert fresh fodder. In the confines of many blinds, breaking open a gun can be a problem. With the rage for longer barrels the last several years, especially in over/unders, the problem becomes even worse. It could become a safety issue if the muzzles become fouled. I love to shoot an over/under for ducks and geese. I try to keep barrel length down to 28 inches to minimize problems. A big advantage of any double gun is the option of two chokes, assuming the shooter has different chokes in the barrels. Of course, some pump and semi-auto hunters shoot very tight chokes all of the time. Further, depending upon how an over/under is set up for barrel (choke) selection, it might not be easy to change over to the other choke when mini-seconds of speed are required. The best-designed safety for switching quickly was on the Remington model 3200 over/under. Its safety was a centered switch. Move the safety lever right or left for barrel selection. But that model, and its safety, is gone. In Great Britain, where they shoot one heck of a lot of waterfowl, you can't even legally take a semi-auto or a pump to the field, yet these across-the-water blokes shoot hundreds, sometimes thousands of ducks individually and yearly with a side-by-side. Plenty of traditionalists in the United States would not consider shooting a duck with anything else. Nash Buckingham's "Bo Whoop" was a special Fox side-by-side. One big advantage of the side-by-side is easy barrel (choke) selection, assuming the gun wears two triggers. The opening distance to eject and reload is not nearly as wide as required by an over/under, a big bonus in the confines of a duck blind. 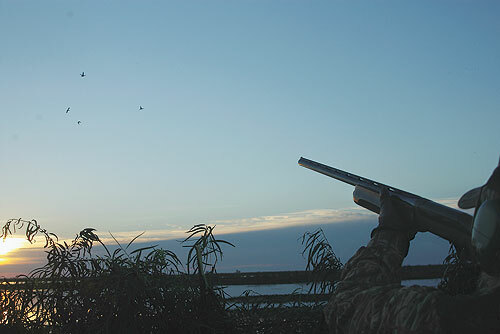 Additional advantages and disadvantages exist for all four waterfowling shotgun types. Hopefully, I've triggered your thoughts. If you come up with additional advantages or disadvantages, please let me hear from you.